Hitting the open road continues to be an increasingly popular vacation option for families. The idea of exploring the country encourages many families to begin planning an RV travel adventure. For travelers looking to experience the outdoors, consider these tips. (Family Features) Hitting the open road continues to be an increasingly popular vacation option for families. As spring approaches, the idea of exploring the country in full bloom encourages many families to begin planning an RV travel adventure. One of the biggest decisions is what type of RV works best for your family. If you’re not sure where to start, begin with a list of must haves. Consider sleeping areas, number of bathrooms and space to haul larger toys like four-wheelers. Knowing what features are essential and having a good idea of the nice-to-haves, too, can help you narrow your options. Renting is a good way to test different models and discover what features and layouts work best for your family. More than 460 national chain outlets and local RV dealerships rent RVs, including state-of-the-art, late-model-year units. A growing number of campgrounds offer on-site RV rentals, as well. There are few better places than local campgrounds to talk to your neighbors about their RVs. Ask about the features and brands they like, what they’d do differently and what tips they have for someone new to the RV scene. Think of your first outing as a trial run. Try a weekend away before diving into a longer vacation. This can let you figure out what you might want to do differently on a longer jaunt far from home. It’s a good way to test your supplies and see what should be added or left behind. It’s also a good way to get comfortable with the controls and operations so you can spend your first extended trip simply enjoying the experience. One of the most important decisions is where you’ll store your RV when it’s not in use. It’s a big investment, so protecting it from the elements and vandals is a priority. Common options are local campgrounds, an RV storage unit or even in your garage. Be sure to weigh considerations like price, security and accessibility for each option before making a final decision. 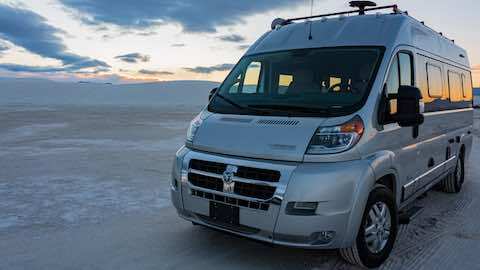 Vacations & Travel "Ways to Rev Up for an RV Travel Adventure"